When the history of mankind is written by our humanoid-Kardashian replacements, we may be surprised by their conclusions. Some worry mankind will be judged harshly for wars, pollution, and Vin Diesel, but each culture brings its own bias when viewing another, and it’s impossible to have any idea what will interest Queen Kimbot-Atron. When pressed to choose only one cultural figure to grace the cover of this history and possibly become the Kardashatron prophet, they may pass over our most obvious cultural icons like a Jesus or a Ghandhi or a Mr. Belvedere, focusing instead on someone whose words seemed to reflect a prophetic insight specific to modern times as well as a disdain for progress and technology–the things that I wager will eventually do us in. Of course, all evidence points to this prophet being Larry King. The Kardashatrons will focus on King not because he hosted a show interviewing celebrities, but because night after night he secretly displayed his disdain for our celebrity-obsessed culture by refusing to learn anything about the guests. Remember when he asked Jerry Seinfeld whether his show had been canceled? KING: They didn’t cancel you, you canceled them? SEINFELD: You’re not aware of this? KING: No, I’m — I’m asking you (INAUDIBLE). SEINFELD: You think I got canceled? SEINFELD: Are you under the impression that I got canceled? KING: Have I hurt you, Jerry? SEINFELD: Is this still CNN? KING: Don’t most shows go down a little? SEINFELD: Most people do also. Of course Larry was pretending he had no idea Seinfeld had the number one show and pretending to be oblivious to all the media coverage of NBC’s begging him to stay. And through his subterfuge sent subtle messages to the audience about the superficiality of celebrity. Masterfully done, Larry King. I had a fourth and fifth, but I’d already far exceeded 140 characters and got up to change the channel but then realized I wasn’t watching TV. Some mocked King because of the column’s banal, introverted simplicity, but little did they know he was holding a mirror to our society and revealing our attention span in twenty years. When I read the column today and compare it to Tweets, his words are almost Shakespearean. Although, I should clarify I mean my neighbor growing up, Todd Shakespeare, and to be perfectly honest most of what Todd said had been memorized verbatim from King’s columns. The Kardashatrons will see a beauty in the simplicity of his prose as King stubbornly refuses to change while the rest of the world sprints towards an unseen finish line, scrambling to make every aspect of life more complicated while shouting the praises of Earth 2.0’s stream-lined efficiency. Slow down, he warns us. Stop and smell the roses, or rather stop and eat the blueberries. Slow down, stop, and look at a police officer on a horse. Really stop and look at him; you’ll be rewarded with a good feeling. Larry King is imperturbable. The Kardashatrons will enter his collected transcripts and columns into their Book (oddly their word for computer) and divide them by the pace of progress and the quotient will be a giant, suspendered shrug. Larry King shrugs at the advances of the digital age. Larry King refuses to let the changing times change him. KING: I’ve never done it, never gone searching. BARR: Oh, my God! It just opens up the whole universe. It’s so awesome. You would love it. BARR: Anything you want to know. KING: The wife loves it. I wouldn’t love it. What do you punch little buttons and things? BARR: You just click on this thing. The thing is you got to be able to read, so you have to have strong glasses when you’ve over 50, and then you just scroll down and click. It’s not that hard. I can show you how to do it. No thanks, technology. Save your breath Roseanne Barr. This sage cannot muster energy to be impressed with the Internet. This is a man who has seen the automobile replace the horse and buggy, electronic mail replace the pony express, and the clicker thingy replace the broom handle thingy for changing channels on the story light box. 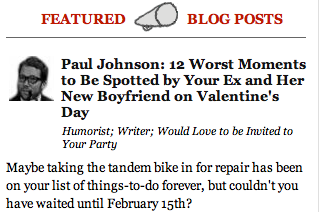 Do not ask him to grow attached to this new Internet fad…he knows it’s all fleeting. I wonder if supplements really work. Have you noticed while looking at paintings, frames are out? Don’t you believe Kermit and Miss Piggy are real? Thank you to Andrew Greene for the wonderful artwork of the Kardashatron Prophet Larry King. 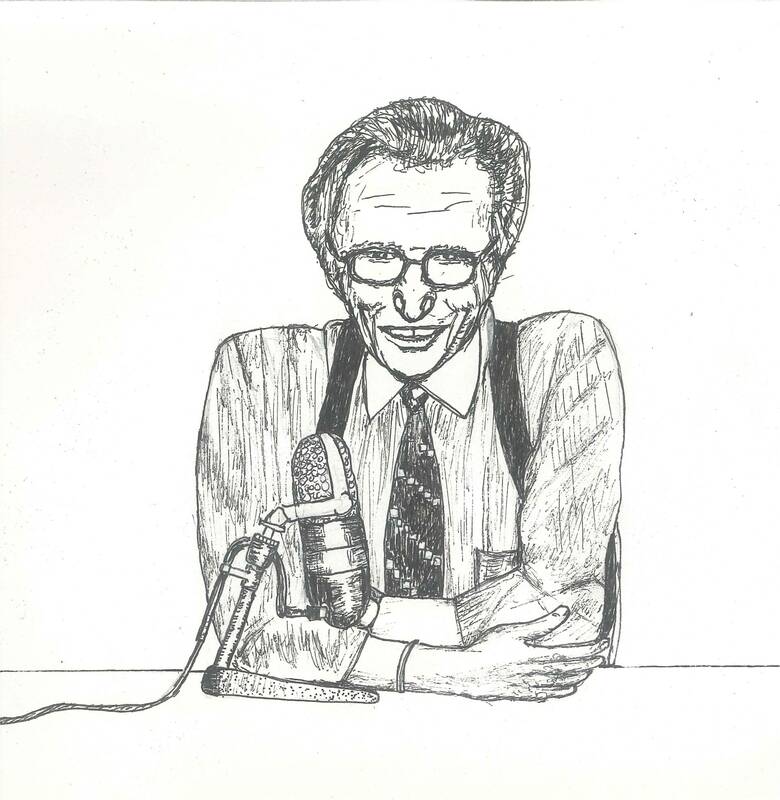 If you have any Larry King artwork, please send me a link and I will post it on this blog. ← We can’t sit here impotently and wait for the Supermoon to attack! We must strike first! I gave you my Larry King artwork. I guess it wasn’t good enough to make it on the site! For a guy who has such genuine disdain for time, the expression on his face is timeless. Now you’ve got me all freaked out for what the future holds! I found your site via Life in the Boomer Lane. I’m enjoying the satire immensely. When I see people fervently thumbing their iPhones while walking into walls and water fountains, I find myself thinking that humans are looking a little bit more like robots every day – less interesting, less of a thinking creature, and oh so boring. But then again, being a luddite doesn’t make you anymore of a thinking creature. Interesting reads – glad I stumbled onto your site. I felt I had to warn society of the dangers of our technological age and the coming humanoid transition. Ironically, I had no choice, but to warn them while using technology as the medium. I’m glad you like the site and I appreciate the comments you’ve made. I knew there was a reason I wore suspenders today. Bella, you already know too much. I wish you hadn’t mentioned Bruce Jenner and his cyborg experiments. I worry you may bring too much scrutiny from government censors. Didn’t someone find incontinence nappies in his rubbish can? Hmm or maybe its just an unfounded rumor I have just helped spread. My bad? I believe that Larry King is an alien. Compare his triangle shaped head to that of the stereotypical alien painting. Also, how else would he be able to bonk his wife’s sister and get away with it. I have never seen a police officer on a horse. I’m struggling to remember if I’ve even seen a horse. I never felt sad about either of those things until now.